Rent Dalton Trade & Convention Center | Corporate Events | Wedding Locations, Event Spaces and Party Venues. Our full-service, 143,000 square-foot Convention Center can accommodate groups up to 1,500 including concerts, expos, weddings, quinceaneras, reunions, birthday parties, meetings of all sizes, proms, fund-raising, and much more. We are thrilled you have chosen to consider us for your upcoming event! Nestled in the foothills of the Blue Ridge Mountains, the Dalton Convention Center is the ideal location for the wedding you've always envisioned. Our facility offers a variety of spacious room options and affordability for all couples-to-be. You and your guests will be surrounded by culture in the historic hills of northwest Georgia, and the proximity to Chattanooga, Tennessee will allow even more chances to explore all the wonder that this enchanting area has to offer. Come discover what Dalton has to offer,and allow one of our Wedding Specialists to assist you in planning the most important and elegant evening of your life. We are pleased that you are considering the Dalton Convention Center for your next meeting. 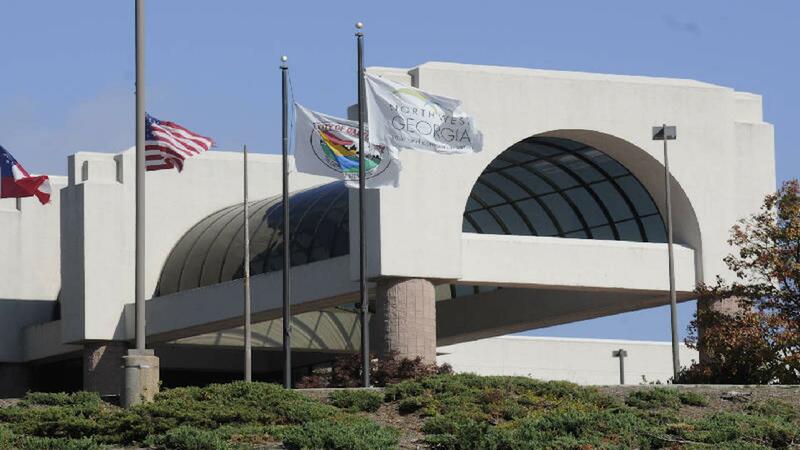 Conveniently located on I-75 between Chattanooga and Atlanta, we are the perfect site for meetings. Our full-service, 143,000 square-foot facility can accommodate groups up to 600 while our staff provides just the right amount of Southern hospitality. And our location provides easy access for all participants.